Automation is a feature which helps us create and run a job, wherein you can choose from your pool of users based on some targeting conditions and ask them to perform some task like sending an invite, signing up or making a transaction or some other custom event. You can configure the Email, Push Notification, or webhooks to send job messages to your targeted users. Also, follow-up messages can be configured to be sent in case the user didn’t reach the goal upon receiving the previous message. Once you are done with setting the targeting conditions and configuring the job messages, you can either start the job immediately or can schedule it to run at some particular date and time. Till now we were allowing users to participate in referral program but didn’t have a way to identify users based on some conditions, asking them to perform an event ie, to invite their friends, do signup or transaction, or any other custom event which could help in expanding the business. There was a need of such feature which could enable us to follow up with some targeted users who could drive the business further. To create an Automation job please navigate to the Automation tab from the left side menu on dashboard and click on ADD JOB button on the top right of the screen, upon which you will be navigated to a new screen where you can configure the various job details, user targeting conditions, messaging options and job scheduling. The whole job creation process is explained in the below steps, please follow them to create a new job. Provide a name for the job which best describes the goal you want to achieve. Define your job’s goal by selecting the type of event you want your users to do, you can select an event from the drop-down menu like Install, Signup, Transaction, or select Perform Event, upon which you would be able to select from any of your custom events. Select “anytime” if users can perform the event anytime after sending the notification, else select “within” and give the number of days within which it must be done after sending the notification, to mark the goal as reached. Note: If you select goal reached time as “anytime”, then by default we will wait for 10 days to complete the goal. If the goal was completed after 10 days of notification sent then we will not mark the user as goal reached. 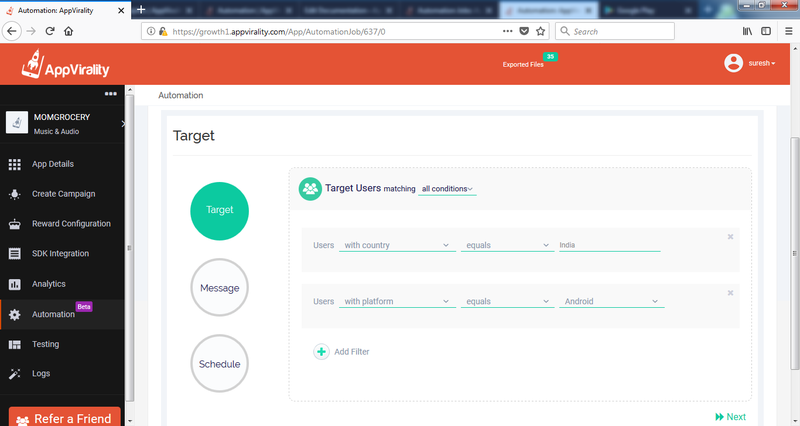 Next step is to configure the user targeting conditions, to target only those of your users whom you want to reach out for achieving the goal defined in the above step. You can configure multiple user targeting conditions to narrow down your reach to the targeted users. Using this condition you can target those users who live or do not live in a particular city. Enter the city name which you want to target. If you want to target users who live in that city then select “equals” before the city name else select “does not equal” if you want to target those users who do not live in that city. Using this condition you can target those users who live or do not live in a particular state. Enter the state name which you want to target. If you want to target users who live in that state then select “equals” before the state name else select “does not equal” if you want to target those users who do not live in that state. Using this condition you can target those users who live or do not live in a particular country. Enter the country name which you want to target. If you want to target users who live in that country then select “equals” before the country name else select “does not equal” if you want to target those users who do not live in that country. Using this condition you can target users based on the number of invites they have sent. You can give invite count as an exact value, less than, greater than, or some range bound value. Also, you can configure the time period in which invites were sent so that while considering the invite count only those invites will be considered which were sent in the entered time period. Using this condition you can target users based on the installs they have driven. You can give install count as an exact value, less than, greater than, or some range bound value. Also, you can configure the time period in which installs occurred so that while considering the installs count only those installs will be considered which occurred in the entered time period. Using this condition you can target users based on reward amount they have earned. You can give reward amount as an exact value, less than, greater than, or some range bound value. Using this condition you can target users based on the operating system platform they use. You can select any type of Platform from the list like Android, iOS, Windows OS, etc. Using this condition you can target those users who are “Friend”, means who were acquired through the referral program. Using this condition you can target those users who are not “Friend”, means who were not acquired through the referral program and installed the app directly without being referred. Using this condition you can target those users who have performed some event. Select the event name from the dropdown menu for which you want to target. Also, you can configure the time period in which the selected event was performed so that only those users will be targeted, who performed the event in the entered time period. Using this condition you can target those users who have not performed some event. Select the event name from the dropdown menu for which you want to target. Also, you can configure the time period in which the selected event has not been performed so that only those users will be targeted, who have not performed the event in the entered time period. Using this condition you can target those users who have made a purchase on your app. Select the Transaction event or any of your custom transaction event from the dropdown menu which you want to target. Enter the targeted purchase value. Also, you can configure the time period in which purchase was made so that only those users will be targeted, who have purchased in the entered time period. The above conditions are all, which you can configure to filter the targeted users. You can add multiple filters to narrow down your target. Once you are done adding all the filters, choose from the top dropdown menu whether you want to apply “All Conditions” or “Any Condition”. If “All Conditions” is selected then the system will fetch the users who satisfied all the conditions given.If you select “Any Condition” then the system will fetch the users who satisfied any of the conditions given. Select Email option on the screen, post which you will be presented the Email configuration form. Select the Email Account from the dropdown menu from which you want to send the Email, in case you have not added the Email, please add it first from under the Email option under App Settings under App Details. Enter the Email subject and Email body, properly describing your job goal to the user. You can add the replacement tokens in the Email, which would later get replaced by their respective values, checkout the list of all the replacement tokens by clicking on Replacement Tokens button. You can see the preview of how your mail job message will appear to the user. Once you are done creating the template for your mail job message, click on the Test icon at the upper right corner of the mail template, which would show you how exactly your mail job message would appear to the user. With the help of Preview option, you can check the mail job message template’s content, formatting, etc and make changes to the template accordingly if required. Click on the Test icon from the top right corner of the mail template, this would open up the preview window. Click on the Test button on preview window. Enter the Email inside Test Email text box on which you want to send the test mail and click on Send button. Check the mail box for above entered email to view test mail. If you want to configure follow up Email(s), in case user doesn’t reach the goal in some specified days, then enter the days count post which you would like to send the follow up Email and click on Done, post which you will be shown the same form again for configuring the First follow up Email, configure the Email as described above, and click on Done. If you want to configure subsequent follow-up Emails you can do so the same way as described for the first follow up email. Select Push option on the screen, post which you will be presented the Push configuration form. Select the platform between Android or iOS for configuring push notification for them and enter the message you want to send, in case your app uses GCM or APN push service for Android and iOS respectively, you need to just enter the message, else select other and provide the push service URL and other request parameters. In case you have not configured your app’s push API keys on dashboard you can do so from under the Push tab under App Settings under App Details. You can use replacement tokens in message in the same way as described in the above step for Email. Click on the Test icon from the top right corner of the Job Message, this would open up the Test Push window. Select the test device on which you want to send the test mail and click on Send button. Check the the above selected test device to view the test notification. If you want to configure follow up push notifications you can do so in the same way as described in the above step for Email. Select Webhooks option on the screen, post which you will be presented the Webhooks configuration form. Enter the webhook URL and other request parameters. You can use replacement tokens in the message in the same way as described in the above step for Email. To ensure that your webhook has got configured properly you can click on the Test icon from top right corner, which would fire the webhook. If you want to configure follow up messages you can do so in the same way as described in the above step for Email. Next step is to schedule the job for execution. You can either choose Run Now or Schedule option to run the job right after creation or at a specified date and time respectively. The time is scheduled in GMT format. There is one more option called Periodic, through which you can schedule the job running time as well as you can configure to repeat the job after some specified days, post which the notifications would again be sent to the users who have not reached the goal yet. If you select “Send notifications to users who reached the goal earlier”, then users who reached the goal will also get the notifications again in the next periodic job. You can select the Expiry option and give the job expiry date, the job will get expired on that date and no more messages will be sent to the users. Once you are done with all the above steps, click on SAVE JOB, upon which you will be prompted to either save and start the job or just save it as a draft, if you choose Yes, the job would start running right after saving, else it would get saved as an Inactive job, which you can start anytime by clicking on start job. Analytics helps us understand the Automation job performance, it presents us with various details like how many users were reached out for the job and the number of users who have reached the job goal, how much revenue the jobs generated for the business, etc. You can view how many users were sent job messages, how many of them reached the goal in the first message or in some subsequent follow-up messages. In the users section, it displays all the users who were selected for the job and how many job messages have been sent to them and whether they reached the goal or not. You can export this data in .CSV format for analyzing it in detail. By default it displays analytics for the current week, but you can choose a date range from the calendar if you want to view analytics for that time period. To view analytics for a job, click on Automation from the left side menu, post which you will be shown all your jobs, click on Analytics icon against the job whose analytics you want to see, it would redirect you to the analytics for that particular job. Appvirality will provide the option of cloning an automation job, which is nothing but creating a copy of the existing automation job. Navigate to Automation jobs page and click on clone job icon of the automation job, it will create a copy of the automation job in draft state. You can edit the automation job and start it. If you clone the automation job in draft or completed or running state, it will create the copy in the draft state with the same name and copy will be appended at the end. AppVirality will provide an option to append unsubscribe link in the automation mails. Navigate to automation jobs and click on the settings icon. In the Notification throttle settings, you will see “Append unsubscribe link at the end of Email” radio button. By default, “Append unsubscribe link at the end of Email” will be selected. If you don’t want to append the unsubscribe link then deselect the “Append unsubscribe link at the end of Email radio button” and save it. You can view all the unsubscribed users list in the dashboard. You can directly add the users to the unsubscribed list so that unsubscribed users will not get any automation and outreach emails. You can delete the unsubscribed users. If the user clicks on unsubscribe link in the automation mails, then they will be automatically add to the unsubscribed users list. You can export the unsubscribed users list by clicking on the export button, an email will be sent to AppOwner or you can get the list directly from the exported files.